All Recipes Not a Mindful Chef customer? 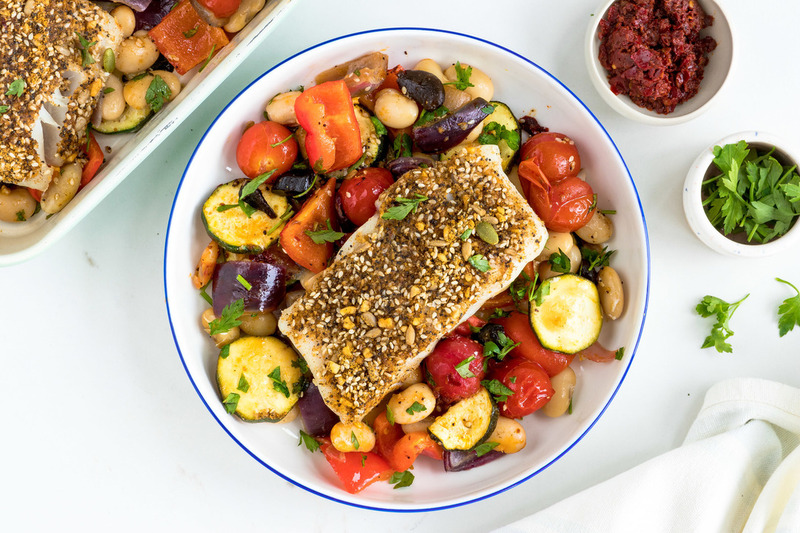 A responsible alternative to cod, fresh coley has a delicate taste that goes well with dukkah, an Egyptian spice blend packed with dry-roasted nuts and sesame. Served with a floral rose harissa and rich black garlic. 1. Preheat the oven to 200C / gas mark 6. 2. Cut the red onion and red pepper into bite-sized pieces. Thinly slice the courgette. 3. Place the courgette, red onion and red pepper in an ovenproof dish (or on a baking tray) with a pinch of sea salt and black pepper and drizzle with 1/2 tbsp oil. Place in the oven for 10 mins. 4. Meanwhile, slice the cherry tomatoes in half and finely slice the black garlic cloves. Drain and rinse the butter beans. Sprinkle the coley with the dukkah and drizzle with 1/2 tbsp oil. In a small bowl, mix the rose harissa with 1 tbsp oil. 5. After the vegetables have been in the oven for 10 mins, add the cherry tomatoes, black garlic and butter beans to the same dish and drizzle over half of the rose harissa. Top with the dukkah crusted coley and place in the oven for 15 mins until the fish is cooked through. 6. Finely chop the parsley leaves. 7. Place the vegetables on two warm plates and top with the dukkah crusted fish. Sprinkle over the parsley, squeeze over the juice from the lemon (to taste) and drizzle over the remaining rose harissa.